Have you ever been invited to a holiday potluck or party at work or school and wondered what to bring? Unless you are a writer for VegNews, a caretaker at a rescue farm, or a chef at a vegan diner in San Francisco, chances are that you will be surrounded by turkey roast, buttery mashed potatoes, egg nog, and, you simply won’t be eating much unless you bring a whole vegan meal for yourself. You’ll also need to make an amazing vegan holiday crowd-pleasing dish to show off your mad skillzzz and the awesomeness that vegan food really is. Basically, you need cake. 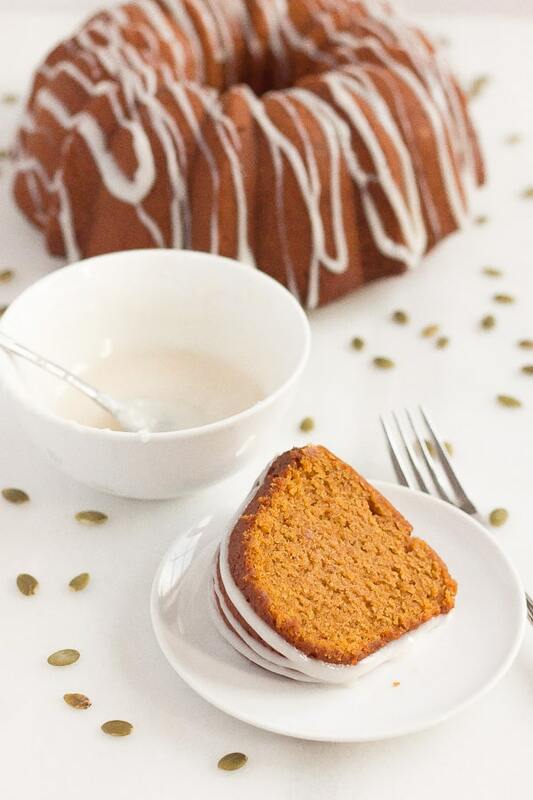 Vegan pumpkin spice bundt cake with vegan cream cheese drizzly frosting, to be exact. Trust me when I say that if this cake is the only thing you end up eating for potluck lunch (more than once slice, obvs! ), you won’t be disappointed. But in all honesty, you may not get more than one slice, because your coworkers will devour this baby right up. It’s just that good. You can thank me later. Just go try it. 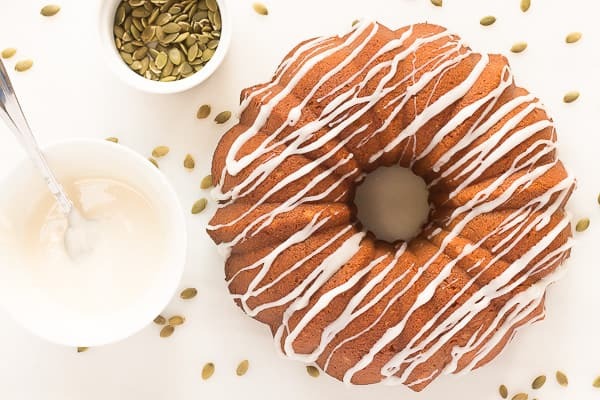 Sweet spiced pumpkin baked into a delightful bundt cake! 2 1/2 tablespoons aluminum-free baking powder Rumford works great! Whisk together sugars, pumpkin puree, oil, almond milk, and vanilla in a large mixing bowl. Add cinnamon, cloves, nutmeg, and salt to above mixing bowl and stir together. Carefully measure flours (scoop and scrape off top of measuring cup with knife without shaking cup to redistribute flour) and add to mixing bowl along with baking powder. Whisk everything quickly together. If flours are measured properly, you shouldn’t need any extra almond milk to add moisture to your batter. But, if your batter looks more like bread dough than batter, you may need to add a few extra tablespoons of almond milk. 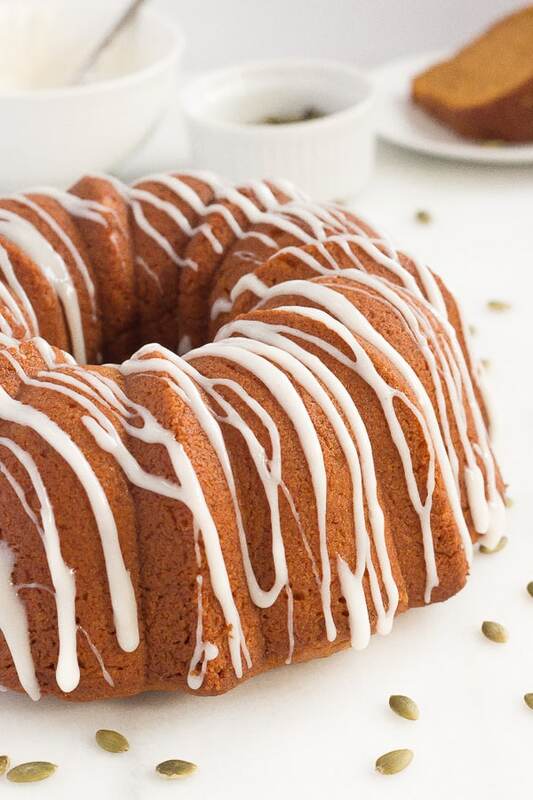 Pour batter into oiled bundt pan. I use a flour infused oil spray to prepare my bundt pan. Bake at 350 degrees F for 60 minutes on middle or top oven rack. Remove from oven, allowing cake to cool for 3-5 minutes before turning over onto cake plate or cooling rack. Whisk together vegan cream cheese and confectioners’ sugar in a small bowl. When cake has completely cooled to room temperature, drizzle frosting over cake, and serve. Keep cake covered, and it should stay perfectly delicious for about 3 days at room temperature, or 1 week refrigerated.